Every week, we’ll be posting new PTE Describe Image practice samples, so make sure you keep checking back! PTE Describe image is one of the challenging tasks in PTE speaking. You are required to describe the important information in a graph, a series of graphs, a table, a map or a process in under 40 seconds. You are given 25 seconds to prepare. In this case, there are two graphs side by side, one for men and one for women. Each graph measures two variables: international rates and home student rates. This bar graph measures British home and international student rates for men and women from 2010 to 2012. The next step is to identify three key features: (1) the lowest, (2) the highest and (3) one other. This shows the range of data. Ensure each feature has a relationship, that is, they aren’t random. (1) The least number of international students occurred in 2010 and were international women students. 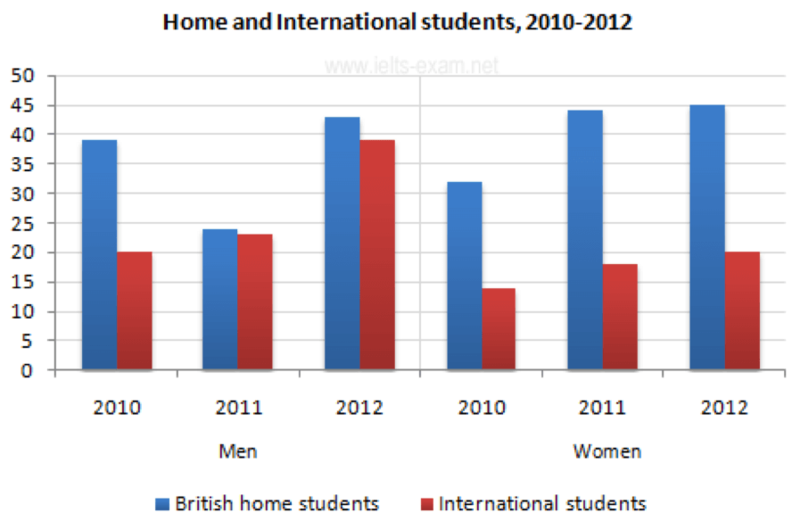 (2) The highest number of students was in 2012, and these were female British home students. (3) In 2012, British male home students and female international students represented the highest number of students in this period of study. The conclusion may be a summary, a prediction or a reason. In conclusion, we can see from the image that the gender and number of students varied throughout the time period, and there is no clearly identifiable trend. Listen to the audio as you read the answer. Pay close attention to the structure and content. Remember that you will be assessed on three criteria: pronunciation, fluency and content. The least number of international students occurred in 2010 and were international women students. The highest number of students was in 2012, and these were female British home students. In 2012, British male home students and female international students represented the highest number of students in this period of study. In conclusion, we can see from the image that the gender and number of students vary throughout the time-period, and there is no clearly identifiable trend. The best way to improve is to practice the 35 Describe Image tasks on the E2Language platform. Also, attend the weekly Monday night PTE speaking live classes. Practice with your tutor, and work hard at improving the three assessable elements: pronunciation, fluency and content. Use the successful structure to order your observations, and practice to a point where it sounds natural and becomes easy to do. 2. Three key features: the highest point; the lowest point; one other. 3. Conclusion: relate the three key features to each other and summarise, predict or give a reason. You have 25 seconds to prepare and 35-40 seconds to describe the image. In the 25 second preparation period, focus on the three key features: low, high and one other. In this practice task, you can take as much time as you need to work out each individual part of the task. 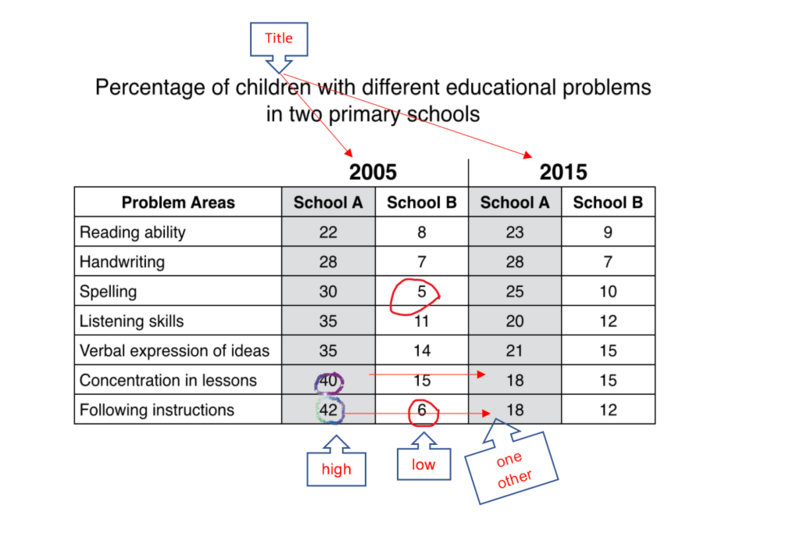 This table shows the percentage of children with different educational problems in two primary schools in 2005 and 2015. The problems occurring least often were spelling and handwriting in School B in 2005. The problems occurring most often were following instructions and concentrating in lessons in School A in the same year. Listening skills were also a significant problem in School A in 2005, improving considerably by 2015. In conclusion, School A’s improvement over the ten-year period may be due to policies effectively solving the educational problems. Listen to the audio as you read the answer. This table shows the percentage of children with different educational problems in two primary schools in 2005 and 2015 (10 seconds). The problems occurring least often were spelling and handwriting in School B in 2005. The problems occurring most often were following instructions and concentrating in lessons in School A in the same year. Listening skills were also a significant problem in School A in 2005, improving considerably by 2015 (20 seconds). In conclusion, School A’s improvement over the ten-year period may be due to policies targeting and effectively solving the educational problems (5 seconds). Title and x-axis: Australia’s share of countries’ imports of coal in 2005, 2010 and 2015. High point: 88% of Indian coal was from Australia in 2010, followed by about 81% in 2015. One other: The Republic of Korea relies heavily on Australia to supply coal. Conclusion: Australia provides from 50% to close to 90% of these four countries’ coal needs. 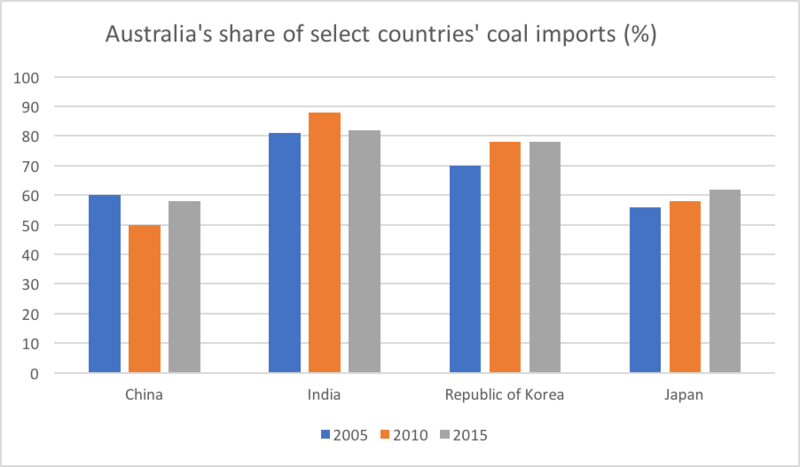 This bar graph represents Australia’s share of countries’ imports of coal in 2005, 2010 and 2015. 88% of Indian coal was from Australia in 2010, followed by about 81% in 2015. About 50% of China’s coal in 2010 was from Australia. The Republic of Korea relies heavily on Australia to supply coal. In conclusion, Australia provides from 50% to close to 90% of these four countries’ coal needs. Describe image is a speaking task so you will be assessed on your pronunciation, fluency and content. Speak clearly, at a moderate pace, don’t umm and aargh or repeat yourself. 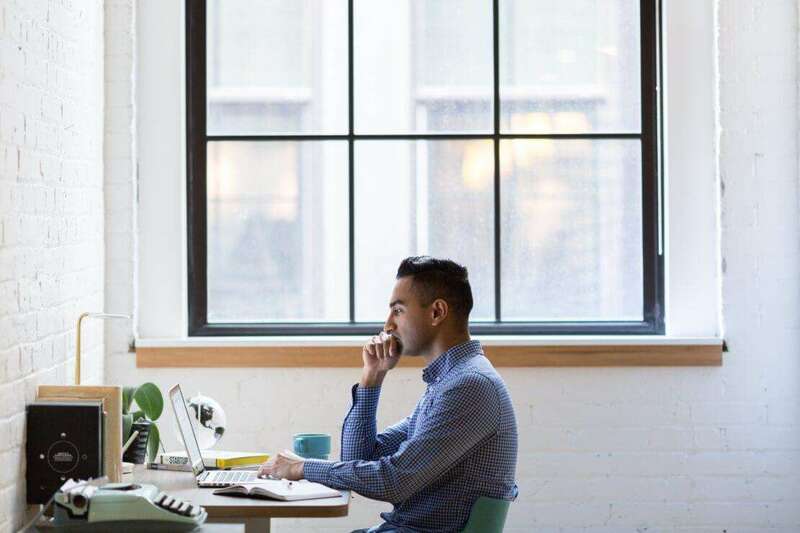 The content relies on you structuring your response in a logical way, covering the major points and drawing a conclusion. In the 25 second preparation period, ensure that you identify the three key features. The first feature will be something about clay being dug out of the ground using a digger. This process has no title so you will have to make one up! Such as…. This process represents the manufacture of bricks using a kiln method. The second feature will be about bricks being shaped in mould or cutter. You may also mention the kiln. The third feature will be about packaging and distribution. After the 25 second preparation period, you will then describe the image using this structure! 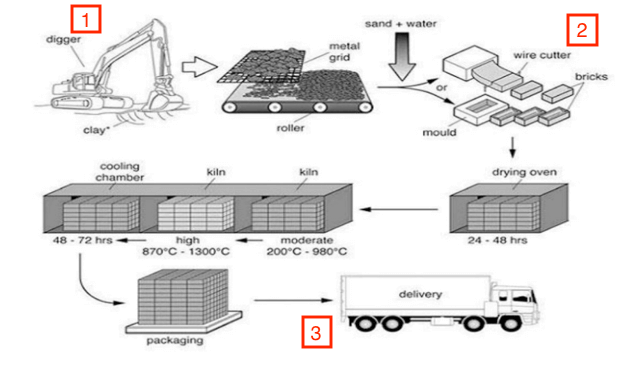 This image represents the manufacture and distribution of clay bricks. Firstly, the clay is dug out of the earth by a digger and sorted on a metal grid and roller. The clay is then mixed with sand and water and shaped in either a cutter or a mould, before being dried in a kiln. The kiln operates at different high temperatures, after which the bricks are cooled. Finally, the bricks are packaged and delivered to their destination. This brick-making and distribution process is a straightforward and effective way of manufacturing bricks for the building industry. I recommend completing all the describe image practice tasks on the E2Language website, and submitting some for assessment from the teachers. Study smartly, and see you in a webinar soon! Now practise using all the practise tasks on the E2language platform. Remember the structure, and repeat it within the time frame for each task.